You will find The Philharmonic Dining Rooms in Liverpool within a short stroll of Hardman Street, Myrtle Street and Hope Street - however you won't find another like it. 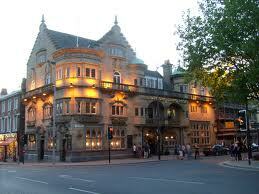 Dazzling and flamboyant, our pub has its own place in history as 'the most ornate pub in England'. Known as 'The Phil', our magnificent hostelry takes its name from Liverpool's Philharmonic Hall opposite. Commissioned between 1898 and 1900, it is a showpiece in the style of a gentlemen's club. With the Royal Liverpool Philharmonic Orchestra Choir and Society so close, we have long been a favourite with concert-goers and performers alike. The Philharmonic Dining Rooms is one of many rare gems in the Nicholson's collection of great British pubs, reputed for their distinctive buildings, intriguing history and vibrant atmosphere.